FC Thunder is delighted to be able to offer free, weekly goalkeeper training with our experienced, licensed, goalkeeping coach, Josh Pulliam. Coach Josh has held goalkeeping coaching roles in Southern California and many other states throughout his 15 years of coaching before arriving in Texas, following his own goalkeeping career in college soccer. 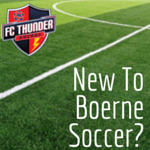 FC Thunder Goalkeeper training follows a curriculum to develop all areas of goalkeeping and is open to all FC Thunder goalkeepers at no extra cost.